I'm not the only person in Wilton Manors that has a Cashew Tree growing in their yard. It's only a seedling now, but it will go into the ground when I can figure out where I can actually plant the blasted thing. When we were out walking a while back, I had a conversation with a neighbor about their Cashew tree. The day before, NPR had a news item about how the fruits were being used in new and creative ways by the people of some rather impoverished areas in India. The fruits were generally eaten locally, and now they could be used as a cash crop. There will be drinks made from the fruits that are supposed to be rich in antioxidants. My neighbor allowed Kevin to pick a fruit from the tree and take it with him. I eventually ate the thing after looking it up and finding out how to eat it and what not to eat. You don't eat the nut unless it is roasted. Since I roast coffee here, I probably could have found a way to do that but instead I dropped it into the pot in the back yard with my Mexican Milkweed. The Monarch butterflies had turned the milkweed to sticks yet again, so it was easy enough to do. A month later, I was greeted by this sight. 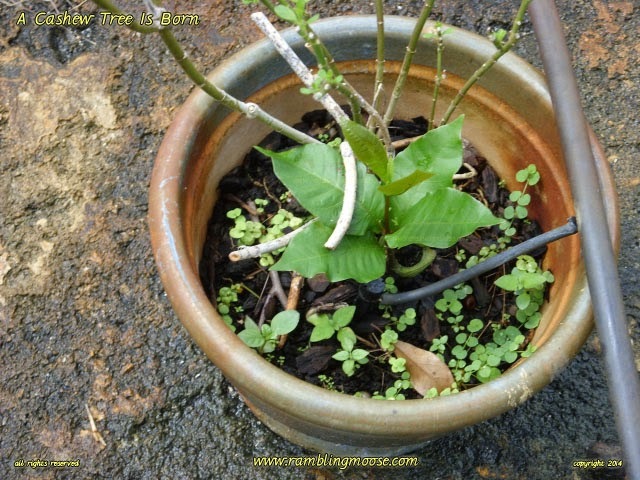 Six leaves growing in the middle of the pot with little bud-lets of leaves on it. That cashew really wanted to grow! It's a True-Tropical tree, so since it doesn't freeze here, it should be fine. South Florida Trivia - The Freeze Line according to the USDA runs East to West on Clint Moore Road in Boca Raton. South of that you won't get freezing temperatures. It's still a little cold here to grow Durian or some other exotics, but the Cashew will be fine. It's going to be a nice addition to the yard. The dog has already taken to it. Yes, Rack has watered it, along with all the other pots on my irrigation lines, and it has survived. Now, if I could only figure out where to pot my Condo Mango in the yard. Every time the irrigation lines get clogged up, I realize it by noticing that the Mango is either turning yellow or it's Fall and I have a bunch of dead Mango leaves to clear up.